Sound Transit released an implementation plan Thursday, laying out more specific start dates for its massive expansion of transit projects across the Puget Sound region. Sound Transit on Thursday announced start dates and more detailed schedules for the raft of major transit projects the agency is taking on, while also urging cities and municipalities to begin planning so rail routes aren’t faced with unnecessary delays. The timelines released by Sound Transit contain the same estimated completion dates for projects as have been in place since before voters approved Sound Transit 3 last year. Light rail still isn’t coming to Ballard until 2035, or to West Seattle until 2030 or to Federal Way until 2024. But the agency released a schedule showing planning, design and construction phases for each project. The first steps for those West Seattle and Ballard light-rail lines, for instance, have already begun as Sound Transit last week started the formal process of looking for a consultant to guide the planning and environmental-impact studies of the projects. The schedule is included in a new system-expansion plan also unveiled Thursday. It calls for both more collaboration with local jurisdictions and transit agencies and more internal collaboration within Sound Transit itself. By the end of this year, the agency will be working on 24 different train and bus projects at the same time — roughly two-thirds of which are just beginning, with the remainder carry-overs from Sound Transit 2. With Sound Transit 3, voters authorized a 25-year, $54 billion package containing 62 new miles of light rail, stretching from Tacoma to Everett, as well as increased commuter rail and bus service. By the time the system is complete, it will have 116 miles of light rail, more than five times the amount that is in service today between Angle Lake and the University of Washington. 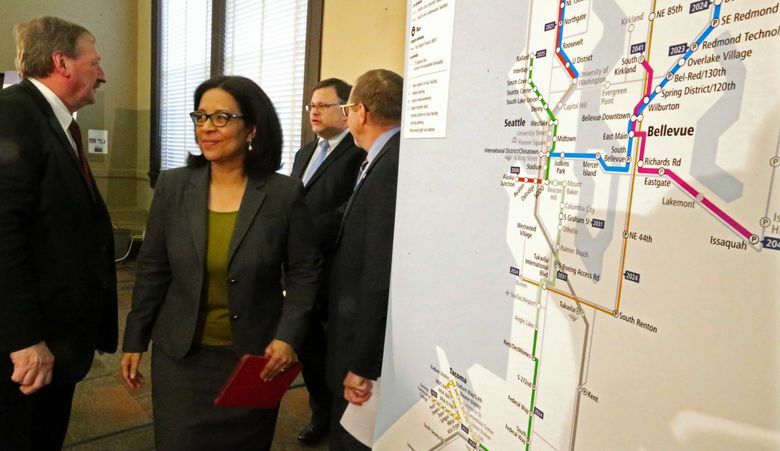 “The plans we’re rolling out today will enable one of the most ambitious transit expansions this country has ever seen,” said Snohomish County Executive Dave Somers, the chair of Sound Transit’s board. 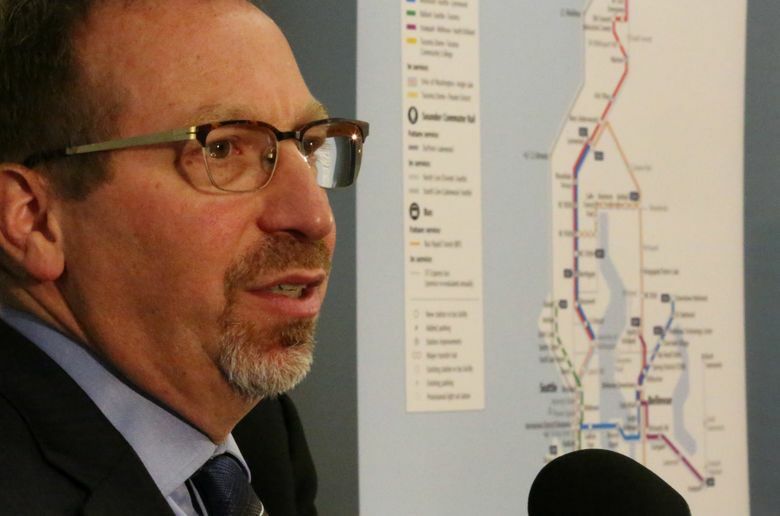 Sound Transit CEO Peter Rogoff noted that the agency’s employees are spread out over five different buildings, with people working on different aspects of the same project often in different buildings. Rogoff said project teams would be relocated so they’re working in the same space. Rogoff downplayed concerns about Sound Transit’s funding stream, which is robust but currently threatened. If President Donald Trump’s 2018 budget proposal were to be enacted (far from a sure thing) three Sound Transit projects could lose up to $1.8 billion in federal funding. And in Olympia, both the Democratic-controlled House and Republican-controlled Senate have passed different bills cutting Sound Transit’s flow of funding from car tab taxes, although it’s unclear if either of those measures will ultimately become law. Rogoff and Sound Transit board members urged local governments to help streamline the process as much as possible. Redmond Mayor John Marchione, a vice chair of the Sound Transit board, cited his city’s past planning as a reason why residents there would see one of the first completed segments of Sound Transit 3 — a light-rail connection between Overlake Village and downtown Redmond in 2024. Redmond, Marchione said, zoned its route specifically for light rail, rather than rely on a permitting process that is slower and involves more complications.